A Whoa-boy is an erosion control mechanism that is similar to a swale or a spur drain that is designed to divert water flowing over an area. By definition it is a “low profile, trafficable earth banks that intercept runoff flowing down roads and tracks” – (Whoa-boys – DERM – PDF). In simple terms a berm or mound of earth angled in a certain manner to force water to flow in a certain direction. We have significant runoff from the driveway and the road that flows down the South Path and has significantly eroded areas of the path and beyond. With the wall supporting the South path finished we put in our first Whoa Boy. 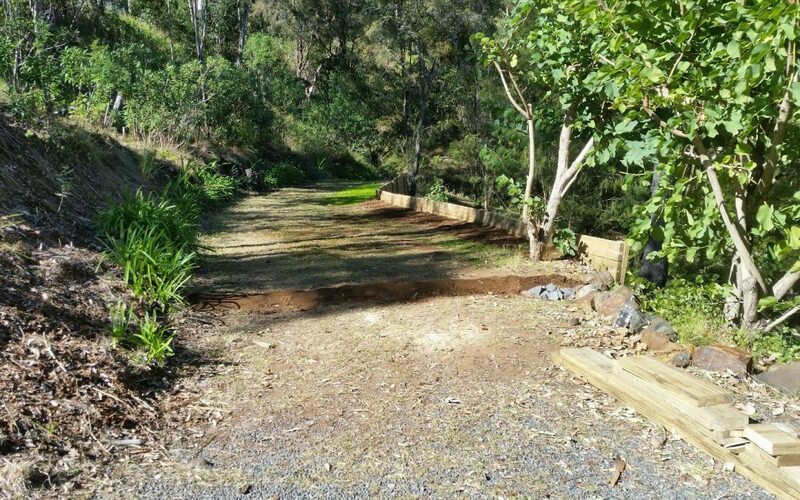 We placed it at the start of the South Path just off the driveway, and it is designed to catch the runoff outlined above and take it to a drain where the flow can be controlled. 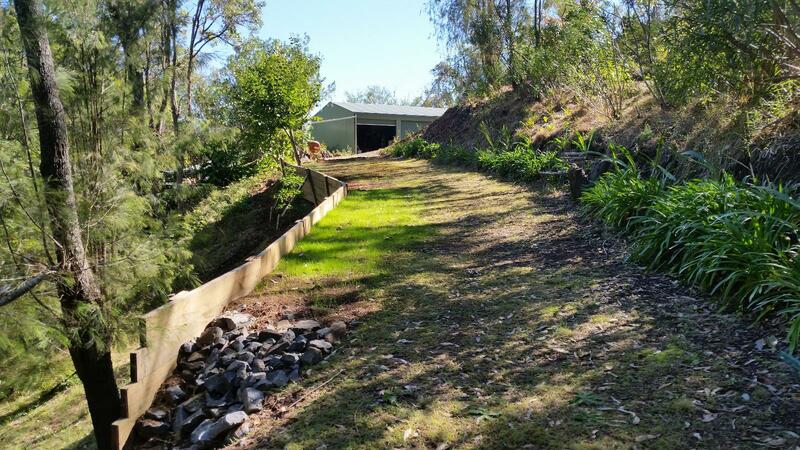 We used simple mountain soil to construct the bank and ensured that it was angled to catch the water flow and to then direct toward the drain. The Whoa-boy has a ‘high’ front edge and and slowly sloping back edge similar to the shape of a aircraft wing. This is to ensure that the Whoa-boy can be driven/wheeled over safely while diverting water flow. After creating and shaping the Whoa-boy we added some topsoil/compost and spread some grass seed to ensure that Whoa-boy had some added erosion protection. The Whoa-boy runs across the South path to a Rock Drain we created that will take the major flow of water down below the South Wal and disturb and control the flow, thereby minimising the eroding effects of the flow. We have plans for more Whoa-boys along the South path and stretching down the South gully road.